Apple is announcing the iPhone 5 at 10:00 AM PST today, and rumor has it that it is expected to have a larger, taller screen, likely 4 inches diagonally, and a slimmer profile. There is also speculation of more radical design changes. Yet, the uncertainty hasn’t stopped 3D printing service Sculpteo from launching a new application that is actually already taking orders for custom 3D-printed iPhone 5 cases. With it, you will be able to design and then have Sculpteo 3D print your own unique case for the iPhone 5, in addition to the iPhone 3G, iPhone 4 and iPhone 4S. You’ll also have the opportunity to browse one of the many existing designs and choose from one of them. 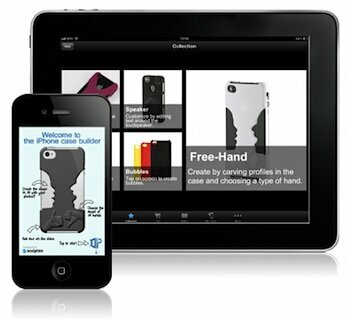 You can design the iPhone case on their website, 3DPcase, or with an iPhone or iPad app also called 3DPcase. The customer will chose from one of five templates — bubbles, comics, curves, free-hand and profile — and then modify it by changing the shape and colors and adding their own images and text. You can already create custom iPhone cases on the various 3D model repositories such as Thingiverse, but the process will take longer, and the cost will be higher. The Sculpteo process should take just minutes and prices start at only $14.99. It’s three hours before Apple iPhone announcement as I write, and 3DPcase is already taking orders for the iPhone 5. Presumably, after the Apple announcement releases the form specs, Sculpteo will fine tune their yet unofficial internal model dimensions and shapes so the iPhone 5 cases will be ready to 3D printed and shipped to your door by September 28. Unlike getting your iPhone 5, there won’t be any lines at the Apple store you’ll have to endure. Just download the design app, or go to the 3DPcase website, and place your order now.